There’s a lot of noise on the internet, especially if you are attempting to understand the economy and how to prepare your personal finances for the future. Many economic news outlets cater not to their audiences, but to their advertisers. Unfortunately, this results in 5 minutes news and discussion, and 15 minute commercials. Twitter (and StockTwits) are incredible platforms for the economics and finance communities to communicate and learn from one another, cutting through the ads and the noise. Unfortunately, in addition to the bias, you are generally confronted with sensationalism to both the upside and the downside. However, sensationalism and satisfactory investment returns do not coexist. Rarely is anything as bad as you fear, nor as great as you hope. 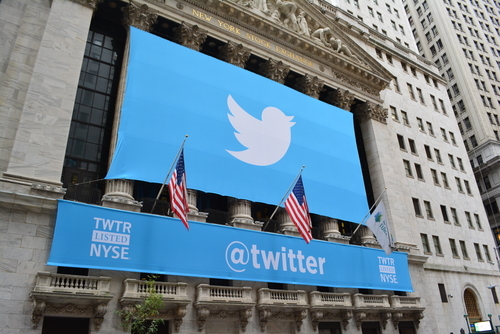 We have compiled a list of financial Twitter accounts that we believe exemplify superior content in the fields of finance and economics on an array of topics not being discussed on mainstream news outlets. As a note, we have not been compensated nor expect to receive any compensation for mentioning any of these accounts. Regardless of where you obtain your information, we encourage you never to take anything at face value and to always do your own due diligence. Jesse previously worked at Bear Sterns; he also co-founded a multi-billion dollar hedge fund. Now he focuses his time publishing the Felder Report. He also just started an investing podcast called Super Investors which is worth checking out. The chart which defines Jesse’s work is seen below. 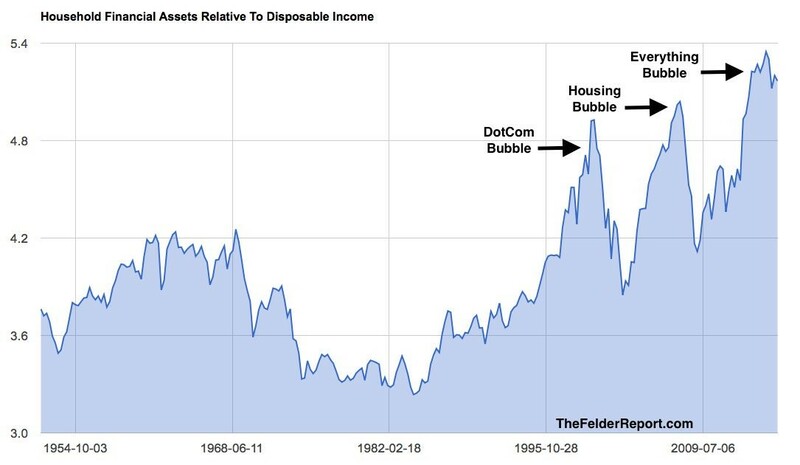 It shows the household financial assets to disposable income ratio. This shows how inflated stock prices have gotten compared to wages. Jesse calls this latest peak the ‘everything bubble’ because the rally in stocks and junk bonds has been broad based. The value in Jesse’s Twitter account is who he retweets because he’s always reading thought provoking content. Michael Lebowitz is the co-founder of 720 Global. He has expertise in macroeconomics, asset allocation, valuations, and risk management. He is a staunch critic of the Federal Reserve’s Quantitative Easing program because he feels it will have unintended consequences. 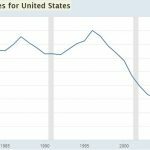 The last time the Fed kept interest rates low, it helped create the housing bubble. This time interest rates were kept lower for longer and the Fed expanded its balance sheet from $900 billion to $4.5 trillion. The chart below is from one of 720 Global’s notes. 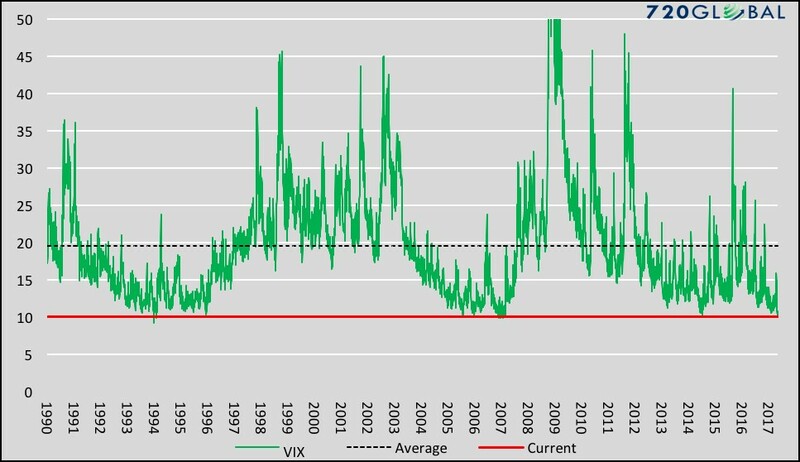 It shows how low the VIX is compared to the past. The VIX measures price volatility in the S&P 500’s options. It is a terrible measure of risk because often when investors think the economy is the most stable, it’s actually the riskiest. Be fearful when others are confident! What I learned this week or 13D Research provides investment research. An interesting quip from its website is the following “Investors base their attitudes on their last traumatic experience. The more traumatic the losses, inevitably, the bigger the bull market in the aftermath. Irrational under-pricing or over-pricing of assets creates the best investment opportunities.” This quote emphasizes the point of being a contrarian investor and the power of mean reversion. Sharp bear markets often lead to long bull markets and vice versa. One of 13D’s main talking points is the dangers of passive investing, which is investing in index funds instead of picking stocks based on research. This crowding into the market could create a extreme selloff when the herd begins to sell. Raoul Pal is the founder of Global Macro Investor and Real Vision Television. Real Vision is what CNBC, Bloomberg, and Fox Business, aim to be, but fall flat. Real Vision features amazing interviews with the top investors in the world, allowing you to see firsthand their thought process. If you invest like a top fund manager, you will likely improve your returns. Raoul is an expert economist, investment strategist, and pays attention to the business cycle closely. One of Raoul’s great calls of 2017 was his bearish bet on oil. Raoul loves to share charts showing his technical analysis on the assets he’s watching. The Long View is a former Bridgewater and Associates employee. He now runs a $1 billion commodity portfolio. As you can tell from his Twitter handle, which features two of the most famous economists, he’s interested in macroeconomics. The combination of the two names is interesting because Hayek is viewed as an Austrian economist while Keynes was in favor of government intervention famously saying, “in the long-run we are all dead.” That is an argument that the government shouldn’t wait for the economy to recover naturally over time. The Long View’s big call came in July 2016 when he went bullish on stocks and bearish on bonds because the government was going to switch from monetary stimulus to fiscal stimulus. This is an impressive call because that was before we knew who would win the Presidential election. In 2017 bonds rallied as the fiscal stimulus didn’t occur in the first half of the year, but stocks remained in a bull market. Jonathan Tepper is the author of two New York Times bestsellers: Endgame: The End of the Debt Supercycle, which was about the sovereign debt cycle and Code Red, which is about unconventional monetary policy. He also founded Variant Perception. Jonathan is a bear on stocks because he feels they are overvalued compared to historical standards. He tweeted the chart below which is the Price to Earnings Multiple to VIX ratio. High stock valuations and low volatility make this index go up. 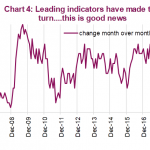 It’s up to its highest level in 18 years showing the complacency in the market. Don Draper is an anonymous Twitter account which explains in its bio the perils of debt. Don Draper was a fictional character in the TV show Mad Men. This account is very critical of central banks’ latest policies as you can see from the statement tweeted below. This statement explains that instead of forcing the market to act in a certain way, policy makers should understand what motivates individuals to act the way they do. Forcing investors to take risk, instead of improving the fundamentals of the economy, could cause mal-investment and unsustainable bubbles. This is an anonymous account who is a fierce critic of central bank policies. The person behind this account has deep knowledge about all things economics. He explains how the Atlanta Fed’s GDP Now forecast works. Whenever the Fed makes a statement, check his feed. His opinions look at the objective data to make points about how the Fed is mistaken. His ‘tell it like it is’ approach makes him one of the best twitter accounts to follow. This is another anonymous Twitter account which criticizes the Fed. Rudolf E. Havenstein was the president of the Reichsbank during the hyperinflation of 1921-1923. This account criticizes inflation targeting because devaluing currencies hurts people. This account got into a spat with Neel Kashkari, the President of the Minneapolis Fed. Neel is the only Fed member who is active on Twitter and he’s also a notable dove, so he has wide disagreements with Austrian economists. Rudolf loves to recount the days of the tech bubble. 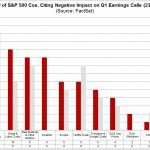 He finds crazy recommendations for the top tech stocks which fell dramatically after the bubble ended. This is the only outright bullish investor on the list. Charlie is the Director of Research at Pension Partners. Charlie is best known for his charts which quantify the latest movement in stocks. If you trade stocks or follow them closely, he’s a great account to follow. The chart below is one example of the type of content he creates. 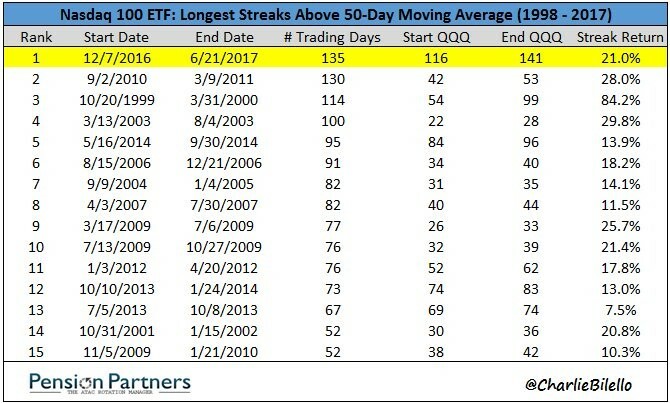 It shows that the end of 2016 and the first half of 2017 had the longest period since 1998 where the Nasdaq 100 was above its 50-day moving average. These charts are unique compared to the plain vanilla reporting on CNBC where they talk about the Dow and don’t delve into interesting details about what’s going on. We would be remiss not to mention our own Twitter account. We created TIMEMONEY.com in 2017 with a very simple mission: to provide you with unbiased, truthful, and objective analysis of current events, the economy and how it all affects your life, money and personal finances. We do not feature advertisements nor are we sponsored by anyone. We cater to you, the audience and for now the content is free. 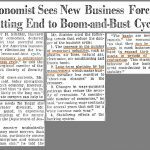 PreviousWhen Is The Next Recession?